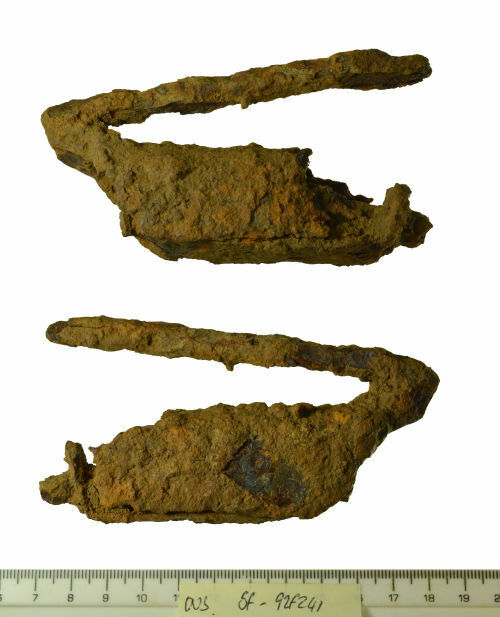 An incomplete and corroded iron barb-spring padlock of Roman to Medieval date. It is missing part of the padlock case due to old breaks, now worn. It has a hollow rectangular padlock case. There is a rectangular hole at one end. This contains the remains of a separate iron rectangular bolt. At the opposite end is a sub-circular bar which is turned upwards to form a U-shape. This padlock measures 110.30mm in length, 57.26mm in width, 23.76m in thickness, 161.89g in weight. There is a similar example recorded by Manning (Manning, 1985, p. 91, no. 010). However, it could be of Roman to Medieval date.